If you start with apple juice, raise the sugar content to that of grape juice, and ferment you get apple wine. Use store bought juice for an easy-to-make dry white wine. Or grind and press fresh apples explore different varietals. Leslie’s Apple Wine – Bottled! I really want to try making apple wine. I know pretty much nothing about wine making. I know of a homebrew shop about 45 minutes from me. I need to know everything I will need to make a sweet apple wine, and I also need step-by-step instructions. I created an easy recipe for Leslie on the fly. Now, it’s one thing to say that a recipe is easy to make, but how do you know until you try it yourself? That’s what I did, and I’m very happy with the result: an easy to make wine that was ready to bottle quickly and tastes good. What really jumped out at me from this experience was the importance of choosing between unfiltered and clarified juice. I’ve made a lot of apple wine, but this is the first time I used clarified juice. I would always buy unfiltered juice; it’s cloudy with a visible sediment at the bottom, and a lot of people (including me!) expect it to taste better than the bright clear juice that next to it on the grocery store shelf. To find out, I’d need to make two batches, as identical as I could except that one used clear juice and the other unfiltered, taste them blind and see. I haven’t done that, so I don’t know. But I do know that if you want to make good wine quickly, the clarified juice wins hands down. I bottled bright clear wine ten months after pitching the yeast without fining. Doesn’t sound quick to you? It had been bulk aging for four months and hadn’t thrown sediment – not a hint, even after agitating. So I could have bottled four months earlier – that’s only five months after pitching the yeast. Even accounting for delays or snafus, I’m confident I could bottle bright clear wine in six months every time. Faster with a fining regimen. Ready to bottle and ready to drink aren’t the same thing. It’s good now, but I’ve seen apple wine improve up to two years. So if you make this, try to spread it out. Drink some now, and open a bottle every few months. Take notes – even if you don’t think you have much to say. Was it smoother (harsher) than you remember? Is the aroma more or less pronounced? Or different in some other way? How about the color? Write it down! You’ll want to know this when you bottle your next batch. You’ll also want to know how the wine analyzed out. If you haven’t looked into the nitty gritty of calculating the alcohol content from specific gravity readings, you’ll be surprised at how complex and inexact it can be. I plugged in my original and final gravities into a number of online calculators, and got a range of 13.3% – 13.7%. I’ll save the discussion of just what goes into these calculations, and why different online calculators might not agree for another time. For now, I’ll just call it 13.5% alcohol. It had a final gravity of 0.994 and a TA of 6.5 g/L, as tartaric. pH was 3.5. On paper, it looks like a crisp, dry white. How does the apple wine taste? And that’s exactly what it tastes like. Apple wine can be fruity or neutral or anything in between. This one has good flavor, with a hint of apple, and a nice finish. I’ve tasted country wines that seemed watery, and others that were full bodied. This one was right in the middle with a just-right medium body. The aroma was muted and it had a refreshing acidity that wasn’t too tart. A good wine deserves an attractive label, and for that you need good artwork. I struck gold when Courtney Bell agreed to let me use this image. The color scheme, the apples, and the first rate photography make it perfect on an apple wine label. Since there isn’t a lot of room when it comes to the text, what you leave out is as important as what you put in. My labels usually have a header, “Apple Wine,” in this case. At the bottom goes a footer, and here I included my website url and a copyright notice from Courtney. Informational text includes the batch number, so I can refer to my notes, and some basic measurements. What about your own labels? Think about wine that you’ve bought. Were you curious about something, but couldn’t find it on the label? Put that in yours. What about things that you glossed over? Don’t clutter up your label – leave those sorts of things out. If you’re thinking about making wine, this recipe is a great way to start. By using clarified juice, you save a lot of steps like processing the fruit and fining the wine. That makes it an easy recipe that’s ready quickly. Another good choice is Welch’s Wine. So stop thinking about it and do it! This entry was posted in Apple Wine, winemaking and tagged nad on May 23, 2011 by Erroll. The Lady of the House and I visited Eaglemont Wine and Cider the other day. They make good wine, we bought a bottle of their red blend, but it was the cider that held my attention. We bought a bottle of that too, and it turned out to be just the thing for watching an old episode of Lost at the end of a stressful day – nice delicate aroma, good flavor, and not too much alcohol. I liked it so much that it got me thinking about how to make apple cider. At it’s most basic, it’s just fermented apple juice. In principle, you could just obtain some juice (from the store, a roadside stand, grinding and pressing your own apples, or what have you) and pitch the yeast. Like most everything else, though, there are some details you should attend to. Make sure the juice has no preservatives (other than sulfite), the specific gravity of a clear sample is between 1.045 to 1.065 (add sugar if it’s too low), and the acidity is between 3-5 g/L as malic. I normally measure acidity as though all the acid were tartaric, but the acidity in apples is almost all malic and cider makers often report TA as malic. To convert, multiply by 1.1193. That gives a range of 3.4 – 5.6 g/L, as tartaric. You can use the Wine Recipe Wizard to help with additions. I’ve made wine from 1-gallon jugs of apple juice you see in grocery stores (Trader Joe’s sells them in glass jugs for less than home brew shops sell empty 1-gallon jugs) and that would be a great way to start making cider. It’s a lot like apple wine, but with less alcohol. Like wine it can be sweet, dry, or anywhere in between. Cider is often carbonated, but it doesn’t have to be. Try it! There’s some confusion about the word, so let me tell you what I mean when I say “cider.” If you start with apples, grind them and press them you have apple juice. To me, it doesn’t matter if it’s filtered, cloudy, pasteurized, or preserved – it’s still apple juice. If you take that juice and ferment it, you’ve got cider. If, on the other hand, you add sugar to bring the potential alcohol up to wine strength and ferment it, then you’ll get apple wine. Cider: Making, Using & Enjoying Sweet & Hard Cider by Annie Proulx – yes, that Annie Proulx. Before she became famous she wrote this great book on cider! Craft Cider Making by Adrew Lea – He learned about Cider from his time at the UK’s Long Ashton Research Station. This entry was posted in Apple Wine, Cider on May 3, 2010 by Erroll. Apple harvest has begun in my backyard, and that’s got me thinking about wine. I’ve made a lot of apple wine, and processed apples a lot of different ways. Blenders and juicers both work, but you have to chop all the apples and process them in batches. I can’t find the notes, but I remember using sugar extraction for one batch. The trouble with all of these methods is the chopping; it’s tedious and doesn’t scale well. What I’d really like is a way to process apples that’s quick, cheap, and easy. So I’ve been on the lookout for other ideas, and that’s how I came across Luc Volders apple a day post. What I like about Mr Volders is that he doesn’t just take ideas at face value; he puts them to the test. In this post he rigorously compares several methods of juicing apples. To me, freezing the whole apple offers a big payoff in convenience over the other methods and I think I’ll give that a try this year. He reported a 68% juice yield, which is slightly less than some of the other methods (70 – 74%). If I don’t have to chop all those apples, it’s a price well worth paying. I’ll probably modify his approach and freeze the apples without coring them, add pectic enzyme and sulfite as they are thawing and allow them to thaw without separating the free run juice. This way, the enzyme and sulfite can work on all the juice. I got a 34-36% juice yield from 8 lb of apples, which is pretty low. This method is basically a way to crush apples without a crusher. They still need to be pressed to get a good yield and that’s where I need to do better. Building or buying a small press? Using more fruit so I can use my 3-bucket press? Maybe. Using a sanitized spatula again? Definitely not! This entry was posted in Apple Wine, other blogs on August 31, 2009 by Erroll. I’ll often make a fruit mead the way you would make a second wine. I made a cherry mead like that last year, for example, and I’ll make an apple mead the same way. I saved the pulp from apples I juiced to make wine, put it in a ziplock bag, and froze it. That’s what I’ll use to make this mead. Mixing one part honey to four parts water will, depending on measurement accuracy and water content of the honey, yield a 1.085 specific gravity must. In goes the tannin, DAP, and sulfite (all dissolved in a little water first). Then, straight from the freezer, add the pulp and let it defrost overnight. By morning the pulp had thawed out, and I added the pectic enzyme. I stirred it all up and it had the consistency of runny apple sauce. I added the yeast, in the form of fermenting apple wine, in the evening. The pulp will contribute to the sugar and acidity of the must, but that sugar and acid is bound up in the solids. That makes it very difficult to measure, so I’m making up a honey-water mixture that would ferment to 11-12% alcohol by itself. The sugar in the pulp will increase that by a small amount, and I’ll just call it a 12+% alcohol level. 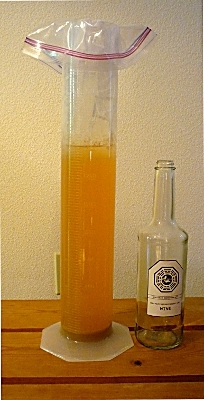 Once the mead has fermented out, all the acid contributed by the pulp will be in the mead. That’s when I’ll take my measurement. I’ll have the same problem measuring the acidity here as I would in any mead, but I’ll take that into account as best I can and make the adjustment then. In the meantime, I get to watch my little yeasties turn some applesauce-like goo into apple mead! Update 10/5/08 – I strained out the pulp using the same three-bucket press that I used on my cherry mead. I didn’t use the third bucket, the one filled with water that does the actual pressing, here because there isn’t enough pulp for the pressing action to be effective. Instead, I used the bottom half of the press like a giant cheesecloth-lined colander with a catch bucket. I now have a little over 1.25 gallons of fermenting mead under an airlock. This entry was posted in Apple Wine, Mead on October 1, 2008 by Erroll. Normally I use my own apples to supplement store bought juice in my apple wine, but this year I had more fruit available so I decided to make it exclusively from my own apples. I followed the same procedure as last year. I don’t have enough apples to justify an apple grinder, but I’ve got too many for a juicer. With no alternative, I used the juicer anyway, and it did the job. One downside to using the juicer is that you have to chop the apples to make them fit in the chute. Another is that you have to stop and clean out the filter frequently. The Lady of the House helped, and that made it a lot easier; she chopped, and I operated the juicer. In the end, the 12.8 lb of apples yielded 2.5 quarts (2.4 liters) of cloudy brown juice. I added sulfite at the beginning and pectic enzyme at the end. To measure out 0.3L (300 ml) of crystalized honey, I added 200 ml of apple juice to a measuring cup. Then I added scoops of honey until the liquid reached the 500 ml line. After some stirring and dissolving, I added it to the rest of the juice then measured another filtered sample – SG 1.090 on the nose! With the TA at about 6 g/L, I decided not to adjust the acid until it ferments out. After that it was as simple as adding the DAP and tannin, dissolving them in a little water first, then pitching the yeast. It’s been several months since I made wine, and its good to be back. I’m excited to see how my first “estate bottled” apple wine turns out, and I’ll be sure to post updates. Would you rather have someone else juice the apples? Someone with efficient, state-of-the-art equipment? And while he was at it, clean up afterwards? Buy store-bought juice. Then use the recipe I made for Leslie to make apple wine with less work and easy cleanup! This entry was posted in Apple Wine and tagged nad on September 29, 2008 by Erroll.